Hello Team Tutu! 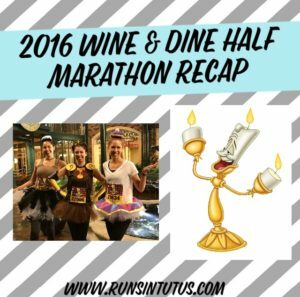 A few days ago we wrote a recap of the Wine & Dine 10K and how much fun we had running with our Dad. Melanie, Christine and I completed Lumiere’s Two Course Challenge, which included both the 10K and the Half Marathon, so here’s a recap of our experience at the 2016 Wine & Dine Half Marathon! First of all, the start was not delayed by inclement weather, so it was already on track to be better than last year! This year, we decided to coordinate our costumes and stick with the Beauty and the Beast theme in honor of Lumiere’s new Two Course Challenge. Melanie dressed as Cogsworth, I went as Babette the feather duster, and Christine dressed as Mrs. Potts. The race started at the ESPN Wide World of Sports Complex and we had a great time dancing at the pre-race party! We really lucked out with the weather this year. It was a little chilly waiting for the race to start, but it felt great when we started running. 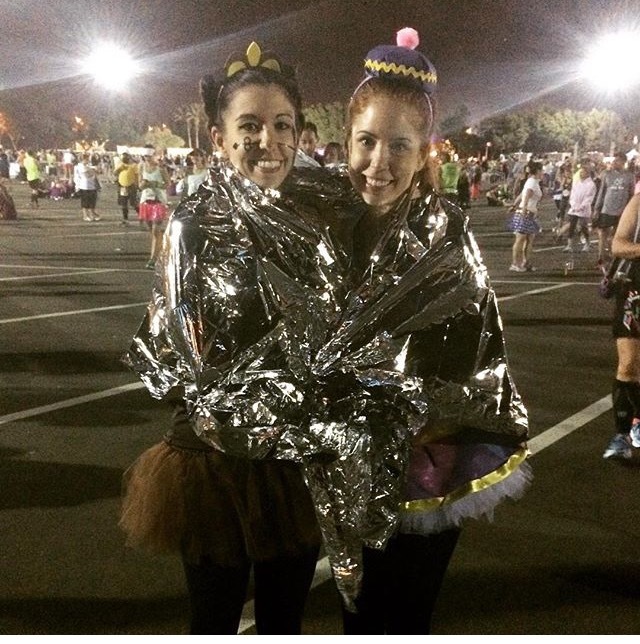 I always pack a few mylar blankets with me so I can stay warm on chilly race day mornings. You can buy a whole pack of them on Amazon for pretty cheap. 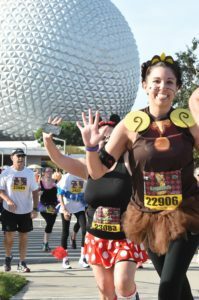 The first few miles of the race were on Osceola Parkway, then we entered Animal Kingdom for a couple magical miles around the Tree of Life and Expedition Everest. 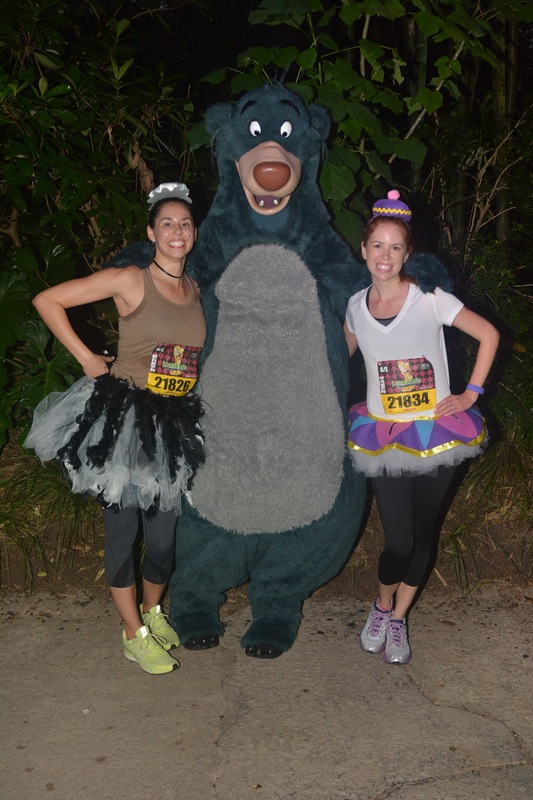 We were really excited to run through Animal Kingdom since that section of the course was removed last year after the rain delay. We made a quick stop to say hello to Baloo, then carried on our way until we ran into Chip and Dale. We were having a great time, but we had no idea what was in store for us as we continued on down the course. We turned a corner and found DARKWING DUCK and LAUNCHPAD. It was a flashback to our childhood and a much appreciated tribute to the cartoons of the 1990s. To top it off, the speakers were playing a continuous loop of the Darkwing Duck and Duck Tales theme songs. Here is a picture of that magical moment in all its glory. Miles 9 through 11 got a little rough. The sun was out, the temperature had drastically increased and we ran up several freeway ramps. The last couple miles of the course took us through Epcot, and luckily we had a big group of spectators there to cheer us on as we entered the park! 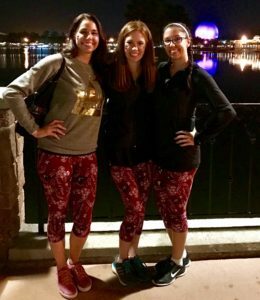 We took a quick trip around Spaceship Earth (aka the Epcot ball) and then raced on to the finish line to earn our medals! 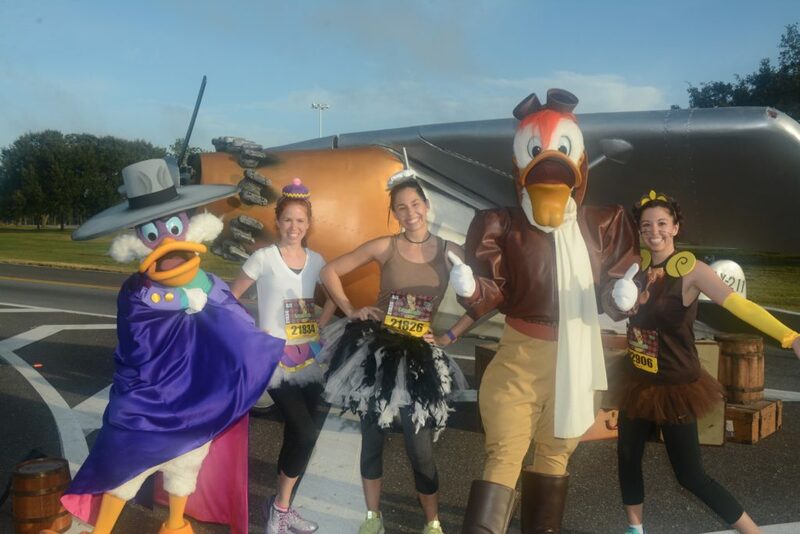 Up until this year, the Wine & Dine Half Marathon had always started around 10PM. 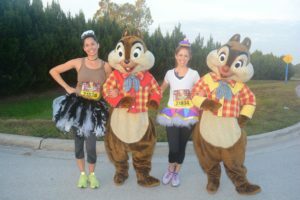 It was a night race that ended in Epcot for a post-race party. I wasn’t sure how I would feel about the change to a morning race, but I ended up loving it. Usually I finish the half marathon after midnight. I’m exhausted and I want to chug water instead of wine. This year, we got to head back to the hotel, take an extra long nap, shower, eat a bunch of food THEN head to the post-race party in the evening. I was completely ready to party and drink wine, and we stayed at the park until almost 2AM. Best of all, we rocked the party in matching leggings from Oh Sew Magical! 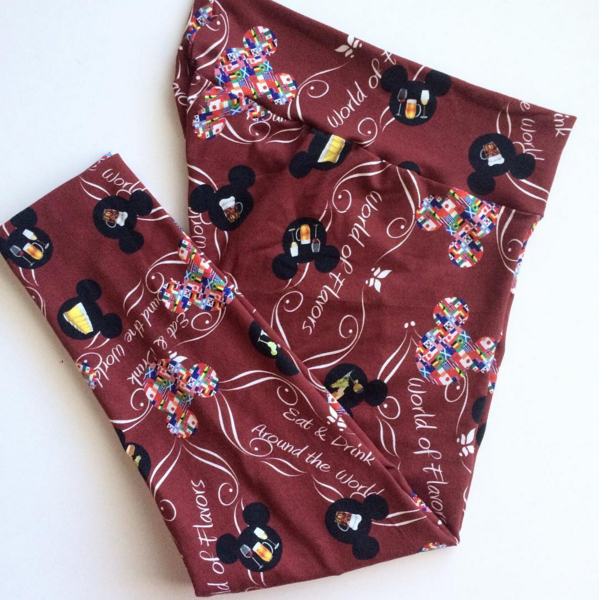 Magical Cheers leggings from Oh Sew Magical! There were definitely a few kinks with the new event schedule. Runners were allowed to enter Epcot for the post-race party beginning at 8PM. Once entering the park, everyone with a post-race party ticket had to stop at one of three locations to pick up a wrist band. The lines to get a wristband were insanely long. Once we picked up our wristbands, we realized that even though runners could enter the park at 8PM, the park didn’t close to the public until later. Around 9PM, the park shut down for an hour as the general public left the park. The rides were closed and every food cart was closed. We couldn’t even find a place to buy a bottle of water. It was very awkward waiting an hour for the park to open back up. At exactly 10:00PM, the World Showcase lit up, music started playing and all the food carts opened up. Most people had been waiting an hour to buy food, so the food lines were long and the World Showcase was packed. We found a nice quiet spot in the Italy pavilion and waited for the crowds to die down. At around 11:30PM the park started to empty out. We only waited 15 minutes to ride the brand new Frozen ride (by the way that ride is life changing), and we could finally stuff our faces with delicious dishes from the International Food & Wine Festival. We ended up having an amazing time at the post-race party and we even met up with a few Instagram friends. If the race is organized the same next year, I highly recommended arriving to the post-race party a little late. It’s a much better experience later in the night when the big crowds start to disperse. 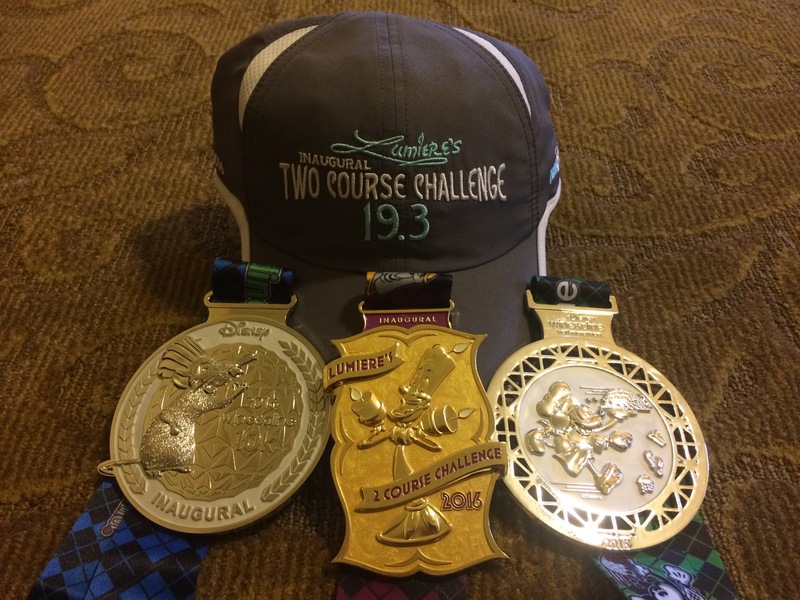 That’s it for our recap of the 2016 Disney Wine & Dine Half Marathon weekend! Congrats to all who participated. We’d love to hear about your experience in the comments below and we look forward to meeting more friends at future runDisney races. 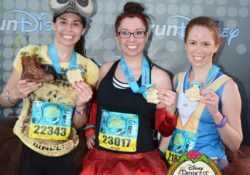 Next year you can find us at the Star Wars Light Side, Star Wars Dark Side, Tinker Bell, Princess and the Disneyland Half Marathon Weekend. Love your recap! 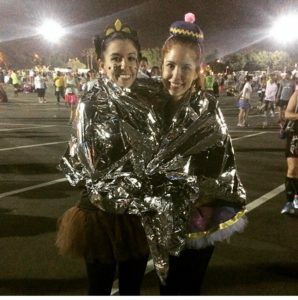 You ladies are downright adorable in your costumes and so fun that you ran together. I’m hoping to get this one in next year (was at the New York City Marathon this year), but I may catch you at Princess! The Epcot party seems a little uncoordinated, but probably worth it for a short wait for Frozen. Congrats! Thank you so much, Lindsay! Hope to see you a Princess Half! 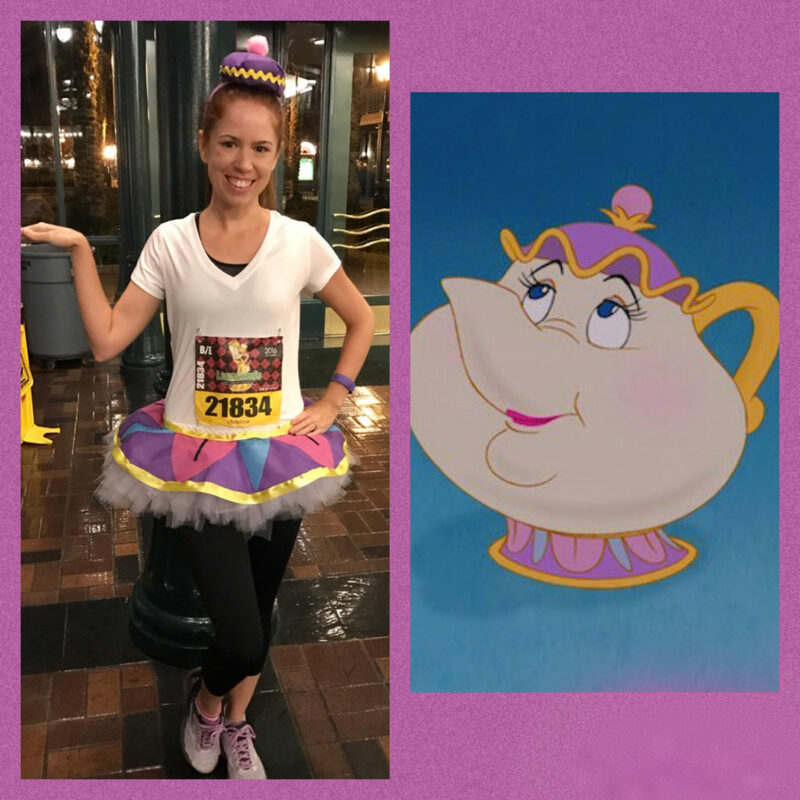 How did you make your Mrs. Potts skirt? LOVE IT! Love your costumes! How was the Babette tutu and hairpiece made? They’re adorable! Hi Lee Ann! Thank you! The Babette hair piece was made from scrap white silky fabric, a grey piece of craft foam, thin black ribbon, and a metal hair bow piece. I cut the white fabric into a circle and then wrapped that circle around a crumbled up ball of other scrap fabric that I had laying around. I just keep wrapping until it made a round pillow looking piece. I hot glued the edges of the fabric that I wrapped around the ball. Next, I hot glued the white fabric “pillow” to the grey craft foam. Once the glue was dry, I trimmed around the edges of the craft foam so it was a curvy flower shape. To make the handle on the top of the hat, I cut a piece of black ribbon and glued both ends to the top of the hat to form a loop. Finally I glued the completed hat on top of a metal hair bow piece. When I wore the had I clipped it in my hair and bobby pinned a couple ends of the grey foam to keep it secure. The Babette tutu is made from white tulle and a couple black and white feather boa strands. The boa strands are kinda pricey so I used the white tulle to make a full base for the tutu. Then I cut pieces of the feather boas and tied them on the tutu waistband as a top layer. I used a crochet waistband for the tutu so it was easier to tie on the tulle layer and the feather layer. Hi do you have interest in selling your Mrs. Potts running skirt? If not, do you have interest in making another? It’s so perfect. It’s exactly what I want for my costume. I am worried I won’t be able to make it as well as you did. Hi, Cassie! 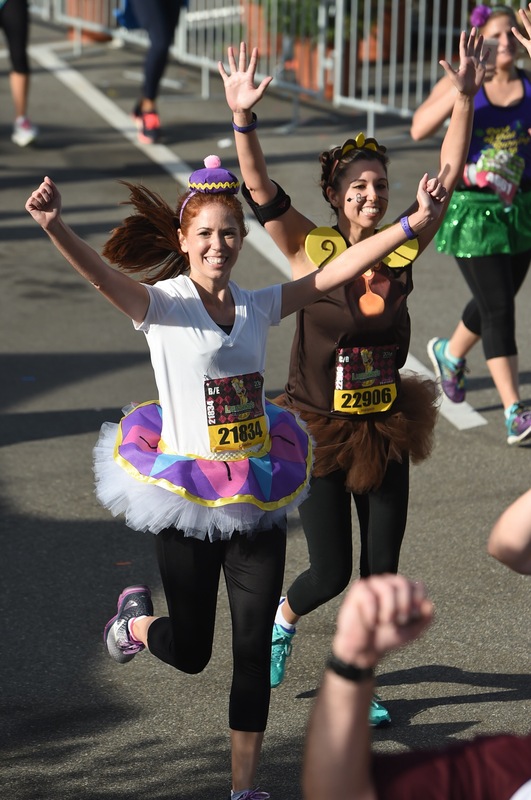 I am so happy you like the Mrs. Potts running skirt! 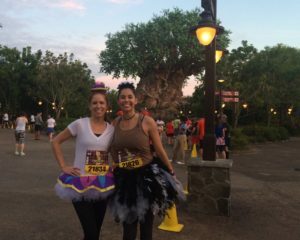 I actually don’t have the skirt anymore because I repurposed it for my friend’s daughter to wear when we ran the princess 5k last year. 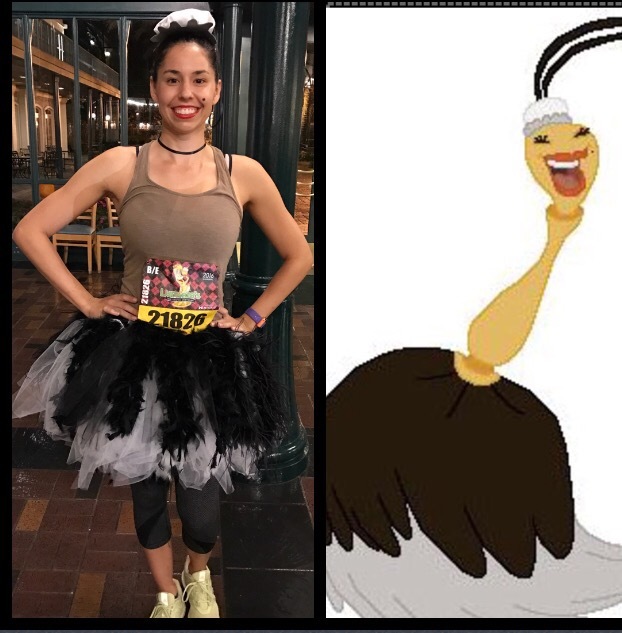 We don’t sell our costumes because we make them to only last a race and with lots of unfinished edges and hot glue =) If you send us an email, (runsintutus at gmail dot com) I can get you in touch with a couple of our friends who make costumes. Hi Shannon! Sorry for our late reply! We seriously dropped the ball on answering your question. Thank you so much for reading our recap! Here are some details about the costume….The cogsworth costume shirt is a brown tech shirt with an iron on image on the front for the pendulum. The shoulder pieces are made from craft foam covered in yellow fabric the black detail on the should pieces is made from thin, round ribbon. The headpiece is made from craft foam glued on a headband. We printed clock hands and a circle for the nose on printable temporary tattoo paper for Melanie to wear on her face. We used the temporary tattoo so that the clock hands would stay on for the length of the race without smudges. Melanie also made yellow mittens out of breathable tech fabric (the same fabric used to cover the shoulder pieces). The tutu is a one layer tutu. Hope that helps! 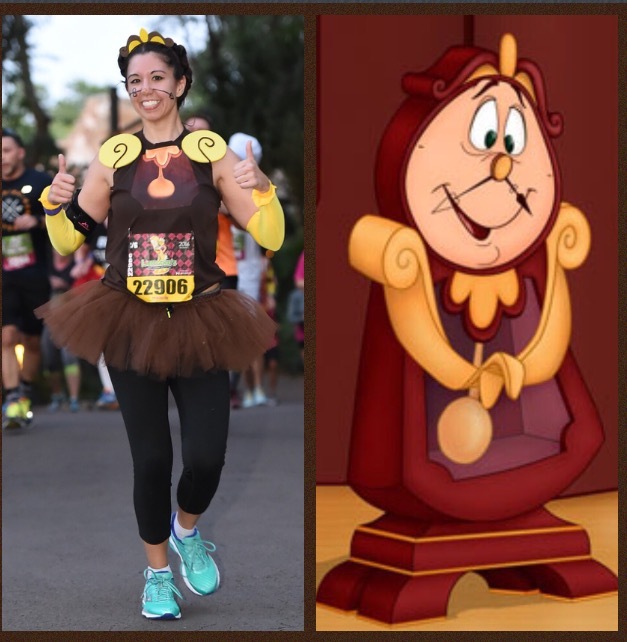 Let us know if you end up making a Cogsworth or Lumiere costume. We would love to see it!